I have recently learned that my time with my current employer will be finishing. And being a person who always seeks the positive in every situation, I see this as an exciting time to take on the next challenge and learn as much as I can. I now have a ‘visual profile’ online – I came across Vizify, an online tool that takes your social media profiles and creates a visual representation. This is great to provide someone with a snapshot of who you are and what you are up to. My new favourite quote: One of my early mentors taught me something that has always stuck with me. I can still hear him say this as I write it, “Don’t compare yourself to others… you will just become depressed.”. I immediately understood what he meant. You will always find someone who can do better than you, earn more money than you, have a bigger house than you etc. However, what is important is to focus on your own ‘life strategy’, and how that aligns to you and your family. I then came across this quote in the last week from Sports Motivation, “Don’t compare yourself to others. Compare yourself to the person from yesterday” . This is now one of my quotes for this year to ensure I use each day to do something better than the day before, and continue to grow. Back yourself: I played representative rugby, and my position was centre or wing. The times I enjoyed the most, was when I ran with the ball, saw an opportunity to take a gap, and backed myself… This should be the approach to life. Opportunities present themselves throughout the year (like my current situation). When they do, you need to make a decision, and back yourself. Strong faith: I have seen once again, through the recent changes in my life, that faith is what pulls you through, keeps you honest and on the right track. Do the best you can, and our Creator will take care of the rest. 2013 is looking really exciting, and I look forward to sharing my journey, learnings and thoughts. 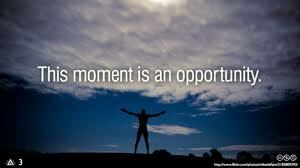 What is your next big opportunity?